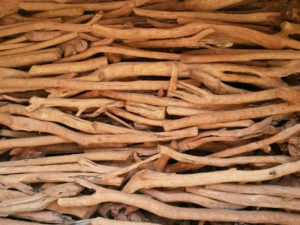 Sandalwood essential oil has been used for centuries as the base oil for attars, due to its unique chemical and energetic properties. During the distillation the sandalwood perfume is described as becoming ‘thin’ as it absorbs the fragrance of the newly distilled flowers. The sandalwood comes traditionally from the Southwest of India, from places such as Kerala and Karnataka. The sustainability issues of sandalwood on global scale have complicated things for the attar distillers and many have turned to synthetic fragrances and replaced sandalwood with bases such as paraffin and other chemical solvents. The question of Indian sandalwood’s sustainability is a real issue and is important. This is not surprising, since it is one of the most expensive woods in the world and there is a high demand for it. At the same time, the heartwood of sandalwood, which is the origin of the essential oil, needs at least twenty to thirty years before it can be harvested. The price of attars have increased exponentially since the 1980’s and 1990’s, due to strict regulations of growth and production of sandalwood that were imposed following the over-harvesting and illegal trade of wild sandalwood in India for decades before then. Australia is now positioning itself as the leading producer of sandalwood. In Australia, companies are planting huge plantations of Santalum alba, the Indian variety instead of Santalum spicatum, which is the sandalwood species native to Australia. Their aim is to become the number one producer of Indian sandalwood in the world. However, the terroir in India is unique. This terroir is required for producing the highest quality sandalwood essential oil. Just because the same species has been planted elsewhere, does not mean the essential oil is the same. There are many factors in terroir, including the spirit of place, that goes into making India’s native sandalwood unique. Severe shortages of sandalwood in India, due to illegal harvesting, disease and fires, has resulted in the Indian government imposing strict restrictions. This meant that until 2002 it was illegal for individuals in India to grow sandalwood and there was a government monopoly. Today sandalwood trees can be grown. The restrictions that made it illegal to cut and harvest the wood or use it or sell it on the open market are only just being lifted. Permission is required from the state forest department, which sent its officials to cut the tree and buy the sandalwood. Such restrictions dissuaded most people from growing sandalwood trees resulting in a lack of legally available sandalwood and soaring prices, allowing countries like Australia to take over the sandalwood market. These sustainability issues are one of the principal reasons that the production of pure attars in India is dying out. We think it would be tragic for this to happen. We believe that if we use these oils judiciously and with respect, by just smelling them, and not using large amounts in a mindless manner, we can honor this ancient art. Our approach with AromaGnosis, using the aromas as living allies, respects the rarity of the sacred sandalwood and enables it to continue to touch us and teach us deeply.